Put a ring on it! Swoon-worthy locations set the stage for epic wedding celebrations in The American Riviera®. Romance is at the heart of what makes Santa Barbara tick. Lovebirds have been flocking to The American Riviera® for engagements, elopements, weddings, honeymoons and romantic retreats for well over a century. 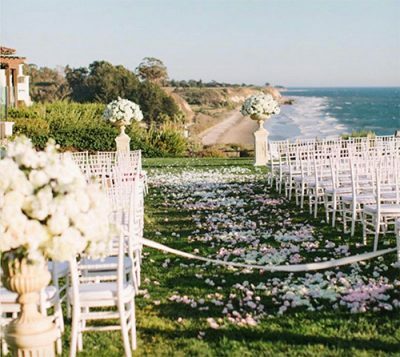 BRIDES magazine recently named Santa Barbara one of the “10 Most Stunning Wedding Destinations for 2018.” It’s just that beautiful. And it’s not simply about looks and dreamy venues—there’s something quite special about how Santa Barbara makes people feel. The buoyant joie de vivre of our laid-back city by the sea is contagious and Santa Barbara’s seductive qualities are no joke. Some of the biggest names in entertainment have succumbed to her charms and tied the knot here. Icons, influencers and super stars like Sir Laurence Olivier, Vivien Leigh, Clark Gable, Gwyneth Paltrow, Sandra Bullock, Lily Aldridge, Kevin Hart, Melissa Etheridge and Jamie Chung are just some of the many who have said “I do” in SB. Inspired? Let’s take a walk down the aisle of some of our most spectacular venues that could easily be the perfect site for the most important party of your life. Santa Barbara’s architecture is a key defining feature and many historic buildings are available for weddings that look straight out of an early California period film—chances are you’ve seen some of them on the silver screen, too. Built in 1929, the Santa Barbara County Courthouse is considered one of the most beautiful public buildings in the country and exemplifies the Spanish Colonial Revival style synonymous with Santa Barbara architecture. A one-stop shop, the courthouse offers several locations for ceremonies (including the popular sunken gardens) and marriage licenses can be obtained in the Hall of Records. On a budget? Six locations are available free of charge for weddings with fewer than 15 people. Old Mission Santa Barbara ties the Courthouse for being the most photographed building in Santa Barbara. The 10th of California’s 21 missions, Old Mission Santa Barbara was built in 1786 by the Spanish and is the only mission to have been continuously occupied by Franciscan friars. Catholic weddings are permitted exclusively in the meticulously maintained church adorned with colonial era art and sculptures. The equally attractive chapel at El Presidio de Santa Barbara State Historic Park is open to all types of ceremonies. Sparsely furnished in 18th century style, the whitewashed walls are lined with simple candles and sconces while vibrant tapestries are painted around the charming altar. Many couples hold their ceremony at the Presidio and host their reception at the Santa Barbara Historical Museum across the street. The museum offers two interconnecting courtyards with bubbling fountains for lovely alfresco soirees. Down the street, Casa De La Guerra is another Spanish Colonial gem where the commander of the Presidio once lived. The open courtyard, located just steps from State Street and across from City Hall, is always fiesta ready with twinkling lights surrounded by red tile roofs and adobes. If you don’t want to manage too many separate vendors, consider one of Santa Barbara’s premier luxury resorts equipped with multiple indoor and outdoor event spaces, onsite catering and other in-house event support needs—as well as very conveniently located hotel rooms for your guests. The three largest properties include the The Ritz-Carlton Bacara Santa Barbara on the beach north of the city; the Four Seasons Resort The Biltmore Santa Barbara on Butterfly Beach in Montecito; and the Hilton Santa Barbara Beachfront Resort along downtown’s palm-lined Cabrillo Boulevard waterfront. For a more intimate hotel wedding, consider the Belmond El Encanto nestled in the Riviera neighborhood overlooking the city. Newly opened in Santa Barbara, Rosewood Miramar Beach provides guest with options to tie the knot, on the Great Lawn with infinite ocean views or directly on the sand at Miramar Beach. Two leading boutique luxury hotels in the heart of downtown offer prime rooftop perches for nuptials and receptions. The Kimpton Canary Santa Barbara’s Mediterranean-style fifth story rooftop can be reserved for weddings with a 360-degree view of the Santa Ynez Mountains and downtown’s sea of red tile rooftops. The newly opened Hotel Californian on lower State Street offers a choice of rooftop locations with panoramic ocean and mountain views. The Hotel Californian’s neighbor, MOXI The Wolf Museum of Exploration + Innovation, also has an incredible rooftop Sky Garden event space. Venues with ocean views are plentiful in Santa Barbara like the popular Cabrillo Pavilion at East Beach, where many couples hold their reception after a wedding on the sands of East Beach or Leadbetter Beach. Note: Permits are required and easily obtained for beach weddings in city limits. Butterfly and Summerland beaches are other enticing options for smaller beach weddings. If you’d like to get out on the water for your wedding, experienced boat charters going out of Santa Barbara Harbor and SEA Landing include the Double Dolphin (41-passenger catamaran), Sunset Kidd (15-passenger Out Island Ketch) and the Channel Cat (149-passenger luxury catamaran). Continuing the seafaring theme, the Santa Barbara Maritime Museum on the Harbor offers a variety of indoor and outdoor venues for weddings and receptions designed by their event planning team, Santa Barbara Ocean View Weddings. Countless green spaces and fragrant gardens dot the Santa Barbara South Coast. For a truly magical garden wedding, membership has its benefits at Ganna Walska Lotusland in Montecito. The 36-acre estate—one of the 10 best gardens in the world—is available for weddings if certain membership requirements are met. You won’t have to jump through as many hoops to access the view at Santa Barbara Zoo with its 30 acres of gardens and scenic event spaces…complete with animal encounters. Elings Park also offers elevated views of the ocean and mountains with three different private wedding spots: Godric Grove, Singleton Pavilion and South Bluffs. 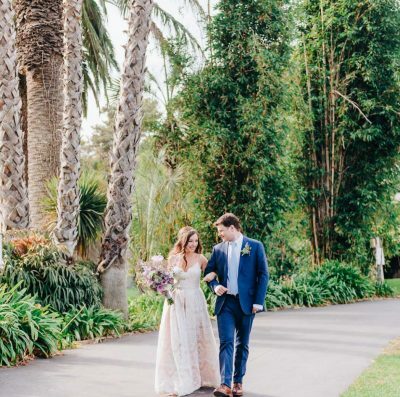 Santa Barbara Botanic Garden welcomes weddings with earthy, organic flair on its 78-acre grounds of California native plantings including meadows and a redwood forest. Naturalists will also appreciate the Santa Barbara Museum of Natural History’s Wooded Area, aptly described as “Nature’s Church” with its majestic oak grove setting adjacent to Mission Creek. The Museum offers indoor spaces for receptions following outdoor ceremonies, too. Just around the bend, the Mission Rose Garden presents a more manicured option with rows of 1,500 roses and an expansive grassy lawn. Alice Keck Park Memorial Gardens span an entire city block and offers elegant garden settings (think gazebos and ponds) at a very affordable price point given it’s a public park. Chase Palm Park is another budget-friendly city gem where you can marry ocean and park atmospheres. With more than 200 wineries in Santa Barbara County, winery weddings are a particularly delicious option. One of the most booked and acclaimed, Sunstone Winery and Villa in Santa Ynez feels straight out of Provence with its olive orchards, courtyards and sandstone caves. Neighboring Gainey Vineyard has a killer historic barn, oak groves and barrel rooms available for rent. The hilltop views from Presqu’ile Winery in the Santa Maria Valley will take your breathe away and their terraces, amphitheater and private dining room give you a variety of spaces to move between. If an urban winery is more your flavor, check out the barrel room in the Carr Winery tasting room in downtown Santa Barbara. Santa Barbara does rustic ranches and country western style, too. Circle Bar B Guest Ranch & Stables can throw down for 130 wedding revelers with onsite guest rooms and cabins that can sleep up to 68 people. Eco-chic is the specialty at El Capitan Canyon, with its glamping-style cabins, yurts and tents as well as neighboring campsites. On the opposite end of the spectrum, Narrative Loft is a raw urban loft space in downtown Santa Barbara that can be transformed into the atmosphere of your choosing. Last but not least on our variety pack tour, the Santa Barbara Polo & Racquet Club is a true class act with 87-acres available for private parties inspired by the sport of kings. We’ve really just skimmed the cream of the crop of what’s possible for your wedding in The American Riviera®. Learn more about Santa Barbara wedding venues and service providers here.